Following its online reveal back in February, the new 2020 Jaguar XE facelift has made its North American debut at the 2019 New York Auto Show. Taking its cues from the Jaguar F-Type sports car, the refreshed sports sedan features enhanced styling, with updated bumpers and a revised grille, along with slimmer headlights and taillights. Its bolder, more aggressive design also makes it appear wider and lower than its predecessor. Inside, the luxurious interior has also been given a significant overhaul. It looks more premium than before thanks to extensive use of soft-touch materials, premium veneers and an all-new door design to improve usability and practicality. Jaguar says "every aspect of the cabin has been enhanced for increased convenience, improved storage and better passenger comfort”. Further enhancing the interior’s premium feel is an optional dual touch screen InControl Touch Pro Duo infotainment system similar to the one found in the all-electric Jaguar I-Pace. 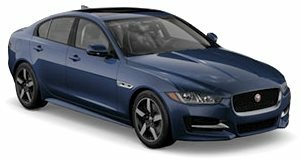 The 2020 Jaguar XE is powered by a 2.0-liter turbocharged four-cylinder producing 296 hp and 295 lb-ft of torque in the R-Dynamic S trim and 247 hp in the base trim. Priced from $39,900, the 2020 Jaguar XE will arrive at dealerships this summer. Also making its North American debut at New York on the Jaguar Land Rover stand is the 550-hp Range Rover Velar SVAutobiography Dynamic Edition, the most powerful Velar ever produced. The British automaker is also showcasing several models from its current line-up at the Big Apple, including the 2019 Jaguar XJ50 limited-edition 50th-anniversary luxury sedan, 2020 F-Type sports car, 2019 Jaguar F-Pace SVR, 2019 Jaguar I-Pace and 2019 Jaguar E-Pace. The complete Range Rover family will also be on display, including the Range Rover, Range Rover Sport, Range Rover Velar, and the all-new 2020 Range Rover Evoque, while the Discovery family will be represented by the Land Rover Discovery and Discovery Sport.